I hope you all are nicely settled into the New Decade! For a while it will be difficult to write the new year 2010 when filling in the dates but it will become easier. January here has started with new snow and freezing temperatures. It was almost -20 this morning and that is what it is supposed to be now in the middle of the winter. It was even colder yesterday. New snow keeps piling up, little bit almost every day and the world is pure and white. When looking from the inside of the house the snow blanket looks very comfortable, if only I had a fur coat warm enough, I would snuggle into winter hibernating. I would not get up before Mothers' Day in May. In May the birds chirping all around would wake me up well-rested and ready to enjoy warm spring and summer. I have only just turned the third page on this new 365-book and this book has to be read as it unfolds, one cannot go and take apeek at the last page to see how the book ends. And the whole of last year and all the decades before were only a prologue for this book. Then maybe not, maybe this is just another chapter in the book "Lene's life and knitting". Let's hope this is not just another printing, let's hope it is at least a revised edition. The rusty sock is still at the same stage it was the last time I looked at it: one quarter of the second sock done. I am not sure but maybe it is the gauge issue. I so love small gauge. But then I have some skeins of heavier yarn in my stash and I really need to work through them at some point. There is plenty of inspiration for heavy yarn lace and maybe that would be the way to go with that stash. I think I will try to make a swatch today. Also i know for sure that I would need to shop a bit for dk and worsted weight yarns too to really see what is out there today and how they feel. I should shop some new yarn ---- how wonderful that sounds? With new yarn would comd new inspiration and new possibilities. When decorating the house for Christmas I came upon the bear that I made quite long ago. I have been turning it over and over and looking at it from all possible angles and wondering if i should plan to knit "somebody" instead of something. A short visit to a fairly tale could be a nice change. This thought is taking up a lot of space in my mind, I just don't know whether the idea is finished or if I should let it simmer a bit. And I have been drawing little bunnies and transferring them onto charted paper to see if that would be a way to go. Lots of unfinished ideas floating around, none of them really sparking off into serious flames of knitting. Not yet, anyway. But there is another new year to see if any of them work out. And as I said, this book doesn't allow peeking. Okay, time to go, get some wood and build a real fire. I love your bear! Happy New Year, Lene! For me, February came before December this year. I was building real fires in November, but now it's less bitterly cold and more typical deep-snow weather. Love those paws! Your critters are always delightful. p.s. Around here, 2010 is already becoming the year of knitting sweaters for myself. Yahoo! What a wonderful bear - the paws in particular! 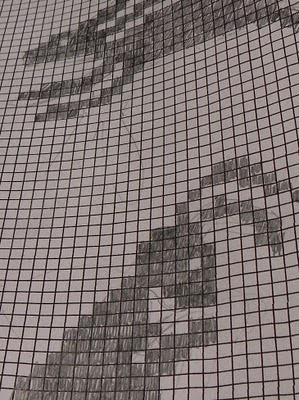 Your drawings on graph paper look very promising too. Give your bear a hug from me! He seems so lovely and full of character. Love the way you see the new year as a book :) A blank bkk were you fill out the pages your self! Your bear is wonderful. I look forward to seeing what develops around him. Happy New Year! A new book, just for 2010...with lots of blank pages. Just think of all the wonderful thoughts/ideas/projects you'll get to write in that book. Love it when I see a new post from you. And hearing about your -20 degree weather makes my 12 degree seem just a little better. I look forward to whatever you choose to share with us from your book 2010. What a grand little bear, great details. Oh my gosh ... his little feet make me giddy! The little paws on that bear are adorable! Onnellista ja luovaa uutta vuotta! Kiva, että saamme myös silloin tällöin lukea pätkän kirjaasi. Terveiset lumisesta Turusta, täälläkin oli pakkasta yli 20, vuodenvaihteessa, nytkin vielä lähes kymmenen astetta. Très bonne année 2010 !... To you and your lovely bear ! The bear is adorable! What detail! Happy New Year Lene! In Yorkshire, England we have 2 inches of snow that has stayed around for over a week and the coldest it has been (at night) is -7 and we have complained bitterly about it! I love your attention to detail and the way you mull over things so carefully. I absolutely love your bear! Especially the attention to detail on the paws. Could you please make the pattern available on line for purchase? I would love to knit one of them for each of my 6 grandchildren! Wonderful bear Lene. Happy New Year. Keep those pages turning. What a fabulous bear - that face, those paws, just wonderful. I can't wait to see what kind of friend you knit him. Oh, that bear is the cutest! Love his beard! What a darling bear - the paws! the face! It's lovely to see you blogging again! I really like your bear and I'm very tickled by the way you did his feet - like socks! Of course! Very tempted to try one myself - I've never knitted 'somebody' before. If you knit a rabbit I would love to buy your pattern! I love RABBITS (more so than bunnies)! He is a cute little bear. How nice to be able to have a nice, cosy fire to keep warm by. Here is just so hot and we are having heat waves for the next few days...bring on winter I say. Aw! This stuff bear looks so cute and adorable. It’s so huggable. Wow! That is the cutest. So sweet of you to create this cute teddy bear.